I use an orange carboy cap/hood for my better bottles - airlock goes in top. No bungs here. ahhhh... do you have a photo online? Good luck! Mixing family and brewing is a must when you have kids. If you use the snow, be careful not to slip on the ice. Of course you could just put some in a bucket and use it like an ice bath. A snowbank makes a good wort chiller. Nice site. Just getting back into brewing (and decided to blog about it) after several years. Like you, I have family - 4 kids (though my youngest is 17 months...not a newborn like yours). Hope your brew day went well. I'm planning on at least racking my porter to secondary (and hopefully brewing an IPA) this weekend. 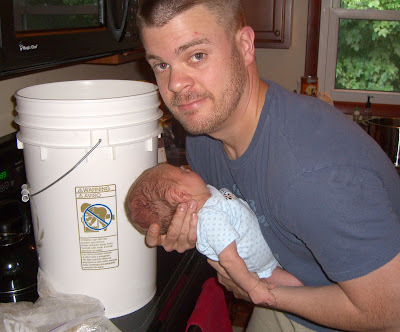 I found your blog just by googling for home brewing blogs. I'll be blogrolling you, once I get around to putting one on my own homebrew blog. Ok, you need to let us know how it went!!! We started brewing about 7 months ago and have been getting more and more in to it ever since. Recently took on a brewing partner (also new to brewing) and we went all grain - it's been great! Adam, that is so true with the kids... I want to teach the boy how to brew rootbeer when he's older. Bull, glad you're getting back into brewing Thanks for blogrolling me!